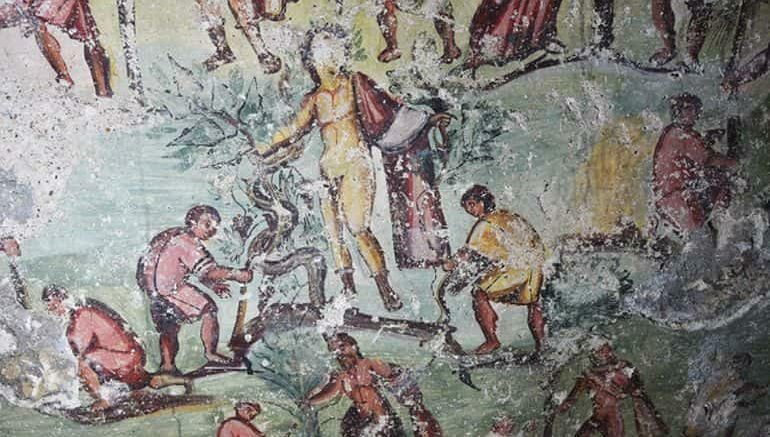 Inside an ancient Roman tomb unearthed recently in Jordan, archaeologists have found a unique comics like mural showcasing life as it might have been in the city of Capitolias, several thousand years ago. Depicting a multitude of colorful figures, including humans, gods and animals, this one-of-a-kind mural also features “speech bubbles”, much like you would find in modern comics. The inscriptions are actually similar to speech bubbles in comic books, because they describe the activities of the characters, who offer explanations of what they are doing (‘I am cutting (stone),’ ‘Alas for me! I am dead!’), which is also extraordinary. The tomb in question was first uncovered in 2016 in the modern-day village of Beit Ras, northern Jordan. Interestingly enough, the discovery in itself was made quite fortuitously, with the unearthing being achieved during works to extend a local sewerage network. Archaeological survey has revealed that the site dates back the late Roman or early Eastern Roman (Byzantine) period, which corresponds to late antiquity. In terms of structure, the exceptionally well-preserved tomb complex – measuring around 560-square-feet (approx. 52-square-meters) – comprises two separate chambers. The larger one among them consists of a basalt sarcophagus that is decorated with the carvings of lion heads. As for the smaller one, the chamber contained two additional graves, but without any accompanying artifact. As we mentioned before, the incredible part of this archaeological scope pertains to the vibrantly colored frescoes that dot the walls of the chambers. Together, these murals depict as many as 260 figures and about 60 inscriptions. 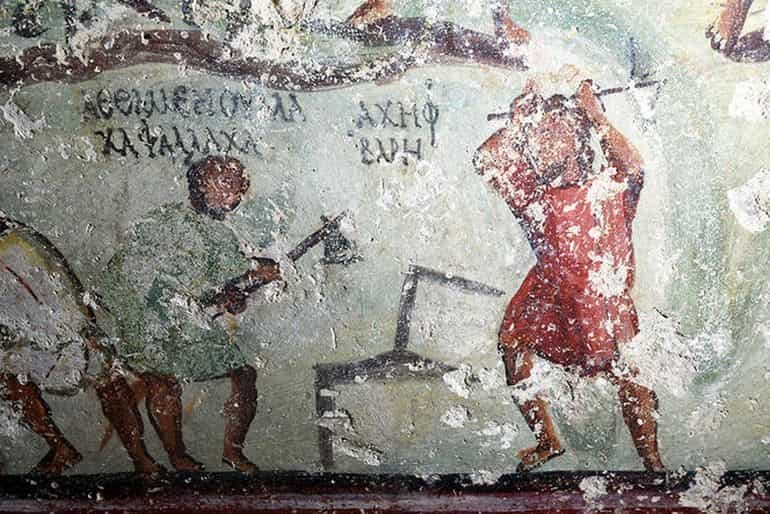 While a few of them deal with mythological renditions, most of the paintings in the tomb showcase scenes from everyday life, including foremen supervising laborers, stone cutters scaling walls, etc. Capitolias (or Καπιτωλιας in Greek) was an ancient Roman planned city, possibly founded circa 97-98 AD for military purposes. It was counted among the ten cities of the Decapolis (centered in southeastern Levant) listed by Pliny the Elder. However, he historical ambit of Capitolias is not just limited to the Roman time-frame. In fact, a particular Arabic poetry excerpt not only mentions the city’s name, but also describes how the settlement contained a 2nd century theater and a later Byzantine church that provided the architectural ‘template’ for the subsequent Islamic buildings (of the Ummayad Caliphate era). From the historical perspective, such comparisons do make sense, since many of the earliest Islamic structures, including mosques and shrines, like the Dome of the Rock, were considerably influenced by early Christian styles, namely the Eastern Roman (Byzantine) palaces and churches from the proximate areas. 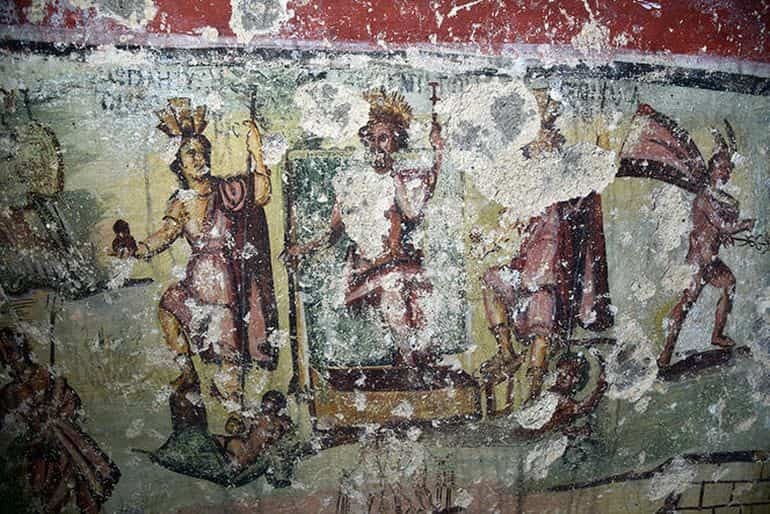 So far, archaeologists have unearthed multiple tombs with colorful murals in and around the region. However, the artwork found in the Beit Ras tomb is exceptional not only in terms of the sheer amount of detail it contains but also in the fact that it features Aramaic text, which is rarely found in murals from the same period, the researchers stated. Currently, a team from CNRS is working alongside the Department of Antiquities of Jordan to excavate the murals and interpret their contents. The preliminary findings of the study will be presented at the 14th International Conference on the History and Archaeology of Jordan in Florence next year.